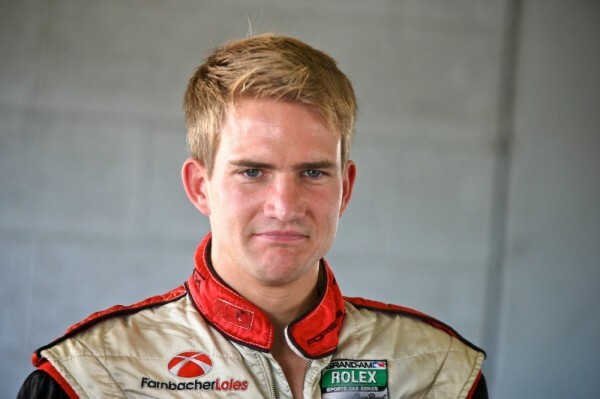 The Porsche Purist team sat down with Farnbacher Loles driver Dirk Werner last summer at Mid-Ohio, one of the foremost race tracks in the Midwest (and, arguably, the U.S.) It was a hot day, yet Werner was still fresh after coming off his practice session in the #87 Farnbacher Loles Porsche. We had first met Dirk informally at Watkins Glen, where we had run into him at the media center, introduced ourselves and shown interest in interviewing him. We were impressed with the young German driver’s approachability and confidence; he was happy to pause to say hello to our team and gladly agreed to a future interview. (He and co-driver Leh Keen later went on to win the GT Rolex race for FarnbacherLoles at the Glen). We made our way to the Farnbacher Loles transporter to meet Dirk. The Farnbacher team [was] always hospitable and welcoming, and this time was no exception. We met [then] manager Frank Resciniti, who (re)introduced us to Dirk. After congratulating Dirk on his win at Watkins Glen, we ask him to tell us more about the race from his own perspective. Earlier in the season, we’d spent some time with Roger Garbow, FarnbacherLoles’ affable marketing director, discussing the challenges Porsches generally face during races. The subject of rear tire wear had been the focus of our conversation. Given the 997’s rear-engine configuration / 40-60 weight distribution, rear tires tend to wear much faster than on other cars competing in Grand-Am. We ask Dirk, did he feel the rears falling off at the Glen? Werner’s character seems altogether calm and focused yet jovial and positive, all impressive characteristics in a young driver. He was born in Hannover, Germany, and grew up in Kissenbruck. Although his family was by no means one of racers, he came to the sport early. “Nobody in my family was into racing,” tells us Dirk, calling his meeting with fate “more of an incident.” His Father and he joined friends on a trip to the local kart track, and young Dirk “drove around and really loved it.” The track hosted a local karting club which hosted slaloms (autocross) and races. Werner joined the club and in his first two years there won the local championships twice. At this point, he and his dad “got more excited” and his Dad bought him his first race kart. Altogether, Werner raced karts for 7 years, and he considers this time great “for learning the basics.” And learn the basics he did, making the move to formula cars. “I was lucky to make the move into formula cars,” says Werner, delving into the story. “I participated in [the ADAC] formula school. They had two groups at the school, and one driver out of every group [was eligible to] win a full season in a Formula BMW car. I won, so I was able to race for free in the first year. So that was easy…” easy? Perhaps for someone with Werner’s talent! However, the road through the European formulas – usually the grooming grounds for Formula 1 drivers, was challenging even for Dirk. “It got more difficult,” Werner tells us. “I moved into another formula series and had sponsors in the first year, but it is really difficult to find sponsors, so my Dad supported me a little bit.” In his second year, he placed 2nd and considered moving into a higher class (like Formula Renault). The series was popular, but it was also too expensive for Werner. “You needed about 200,000 Euros for a seat,” said Werner. The fact that this was a spec series meant Werner – who was only able to make only minor adjustments to the car—had to rely exclusively on his skill set. “Everyone was going to the max,” smiles Werner, adding, “and you couldn’t do a whole lot to the cars.” The primarily German series raced in several big tracks, including the Nürburgring Nordschleife, and Hockenheim. The oddest car Werner has driven on the Nürburgring? His own Volkswagen. “I learned the track in my VW Polo,” smiles Dirk, adding, “it was too hard for the car…all the doors were shaking and material was getting loose because I took the curves hard. It was not good! It was ten years old…” It has since been replaced with Dirk’s current daily driver, a VW Golf [now updated to a Porsche GT3 as a result of his recent award from Porsche]. As a driver who not only has driven tracks in both the USA and Europe, but has also driven the circuits simultaneously, we ask Dirk to compare the tracks/series/drivers for Porsche Purist. When we ask him about the music he likes, tells us his iPod was recently stolen. “I really like a lot of music. It depends on the situation. If I go out, I like dance music or slow rock. I listen to rap sometimes. I don’t play an instrument – I would like to because I think it’s really fun to be able to play an instrument and make music, but I am really just too lazy I guess! It is too hard for me.” Lazy is the last word that comes to mind when we think of Dirk Werner. After having enjoyed a half-hour talking with Dirk Werner, we wish him and co-driver Leh Keen good luck in the following day’s Grand-Am race at MidOhio. He then goes on to win this race and eventually Acxiom GT the driver's championship, earning yet another notch in his stellar career to date. Be sure to come back later in the week for our interview with last year's Daytona winner, David Donohue, and be on the look-out for our interview with ALMS rising star Melanie Snow. A very fine interview – kudos!! What a shame we have lost Dirk Werner to BMW and Leh Keen to Mazda – in more ways than one. I hope they both can return to Porsche someday.